If you desire a holiday filled with temples and tombs, pharaohs, and phenomenon, this is the trip for you. Egypt is the land of allure and mystery which is best enjoyed on a multi-adventure week. This trip is designed for those that want to understand Egyptian culture, food, and people. Although you will be travelling by horseback for several days, you will also explore this mystical place on foot, tuk-tuk, harong, camel, and boat. Come and join Ride Egypt for this exciting holiday to broaden your knowledge of ancient Egypt! During this holiday, you will stay overnight at the Labranda Garden Makadi in Hurghada, the Villa Nile House in Luxor, and the Mercure Cairo Le Sphinx in Cairo. Labranda Makadi Garden is located in Makadi Bay, just five minutes from horses and stable and in close proximity to the beach making it the perfect destination for those looking for a quality beach holiday by the Red Sea. The hotel boasts 281 modern decorated rooms with balconies overlooking the pool or the garden. The hotel’s facilities also include a spa which provides guests with the ability to book relaxing and serene treatments during their stay. Labranda Promenade is located between Labranda Royal Makadi and Labranda Club Makadi. It features an amazing array of dining outlets such as the Greek Taverna Paros, the Cuban Pequeña Habana, the Rock, and Roll Burger House, Yum Asian Kitchen and Bar, Café Cairo, and Gelateria Giardino Delle Rose. Villa Nile House is a quirky charming guest house with the outstanding service. Built in an oriental style with traditional materials like wood and cob, and comfortably decorated, it has two terraces on the roof with views of Luxor temple and Hatshepsut temple. When you enter the grounds, you will be delighted by the flower garden and enjoy the Bedouin corner to relax and drink a mint tea or the traditional Egyptian karkade. At the back of the garden, the swimming pool, jacuzzi, and hammam are waiting for you. From the patio, you will find the dining room. An open-air stair will lead you to the bedrooms and to two terraces on the roof. Each of the charming bedrooms celebrates Luxor so find yourself staying in Hathor, Nefertiti, Kheops, Cleopatra, Nefertari, Akhenaton, or Touthankamon to name a few. Each room is full of character and has air-conditioning, an LCD television, and Wi-Fi access. Also, each has a private bathroom and an outside sitting area close to the room. You will ride fabulous horses to explore local Bedouin villages and see temples up close, and of course, you will float down the Nile River for a day enjoying classic Egyptian foods. 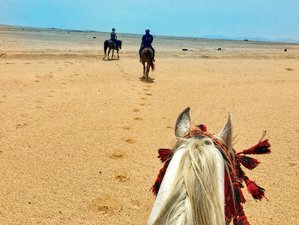 You will visit the Seventh Wonder of the World by horseback, swim with wild dolphins, go snorkeling, and ride your horse in the Red Sea. During this incredible week, you will visit the site of the Great Pyramids of Giza, ancient Thebes, and the Royal Tombs of the Valley of the Kings and the Valley of the Queens which are on the river’s west bank. If you have ever wanted to learn about ancient history while trying new things, Egypt will provide an experience of a lifetime. You will also explore the Pyramids of Cairo, Cairo museum, Karnak Temple, Medina Habu Temple, and other ancient mosques, temples, and tombs as well as visit souk markets, Khan el Khalili market, banana plantations, farmlands, and water buffalo. You will be picked up and transferred to your hotel. In the morning, you will head off into the desert to explore the vast golden stretches of sand surrounding Hurghada. The openness of the desert beneath the mountains allows you to do what your horses love to do most - notch it up a gear and fly through the shadows of the gently warming morning sunshine. After an hour’s ride, you will meander down to the coast and cool off in the ocean with your four-legged friends. Stepping just out of their depth and splashing about in the crystal-clear waters, you will experience a truly memorable time swimming with your horses in the Red Sea, followed by a delicious lunch on the beach and some time to relax. As the sun starts to set and the heat of the day begins to fade, you will saddle up again for a two-hour sunset ride late afternoon. As Egypt offers some of the most spectacular sunsets, you will ever witness, be prepared for a kaleidoscope of colors as the last of the day’s rays dance across the desert, and glisten on the lapping waves of the sea. This is time for some downtime and a chance to relax as you set sail for some non-riding fun. You will get ready to tick yet another box on your bucket list as you explore the underwater beauty of the Red Sea. Armed with a snorkel and mask, you will lower yourself gently into ‘Dolphin House’ where you are guaranteed to come face-to-face with wild dolphins, colorful fish, and plenty and brightly colored coral. After a stunning day at sea, you will sit back and relax as you will transfer to Luxor by a private car in the evening and settle down for the night at your accommodation, Nile Villa House. Luxor is a far cry from the golden sands of Hurghada and perfect in its very own way. As you will head off in the morning on the horses, you will experience a very relaxed and glorious introduction to real Egypt as you ride through the traditional villages and sugar cane fields to Banana Island. At Banana Island, you will stop for a refreshing cold drink before winding your way back along the River Nile for a spot of lunch at your hotel. In the afternoon, you will saddle up and ride to the Mortuary Temple of Ramesses III - Medinet Habu. This temple is an important New Kingdom period structure on the West Bank of Luxor. Aside from its size and architectural and artistic importance, Medinet Habu is probably best known as the source of inscribed reliefs depicting the advent and defeat of the Sea Peoples during the reign of Ramesses III. The Temple of Rameses III is one of the most well preserved and incredible temples in Luxor. Here, you will dismount and explore with a private tour inside, while your guides tend to the horses. As history goes, this has got to be one of the most spectacular, awe-inspiring leaps back in time you could ever imagine. Today, you will retrace the steps of the Pharaohs throughout the Valley of the Kings Tombs, including those of Tutankhamun and Queen Hatshepsut. The Valley of the Kings is a valley in Egypt where for a period of nearly 500 years from the 16th to 11th century B.C., rock-cut tombs were excavated for the Pharaohs and powerful nobles of the New Kingdom. This is also the location of the tomb of Tutankhamun, where on November 26, 1922, British archaeologist Howard Carter and Lord Carnarvon entered the tomb, discovering an immense collection of gold and treasures. On February 16, 1923, Carter opened the innermost chamber and found the sarcophagus of King Tut. When asked what he could see, Howard Carter wasn’t able to answer. He could barely speak because he was gazing on the most amazing archaeological discovery ever made. Queen Hatshepsut is distinguished in history for being one of the most successful pharaohs of Ancient Egypt. She was also a woman and is generally regarded as one of the first female historical figures whose exploits are known to modern historians. Hatshepsut was the fifth pharaoh of the 18th dynasty during the New Kingdom. The dates of her reign are debated by historians, but she is thought to have ruled Egypt for 22 years from 1470 to 1458 B.C. After a truly magical morning of history, your lunch will be served locally, and you will take a private boat at sunset down the Nile for dinner. There will be an optional but highly recommended sunrise balloon tour followed by a fantastic tour of the East Bank of Luxor including Karnak Temple, Avenue of Sphinxes, Luxor Museum, and Luxor Temple. Karnak Temple dates from around 2055 B.C. to around 100 A.D. It is a cult temple dedicated to Amun, Mut, and Khonsu and is the largest religious building ever constructed. This derelict place is still capable of overshadowing many wonders of the modern world and in its day must have been awe-inspiring. Karnak Temple comprises a vast mix of decayed temples, chapels, pylons, and other buildings in Egypt. Construction at the complex began during the reign of Senusret I in the Middle Kingdom. From Karnak, you will go onto the avenue of sphinxes, an avenue of human-headed sphinxes of over one and a half miles (about three kilometers), which once connected the temples of Karnak and Luxor. At Luxor temple, Amun has magically transformed into Min the god of fertility. Luxor Temple is why Luxor has earned its nickname, 'the world’s largest outdoor museum'. Luxor Temple is built on the site of the ancient Egyptian capital of Thebes. The temple is one of the best preserved of all the ancient monuments with large amounts of the structure, statuary, and relief carvings still intact, making it one of the most impressive visits in the Luxor area and all of Egypt. Adding significantly to its allure is the juxtaposition that its setting provides, the modern city begins on one side and the Nile drifts by on the other. There are few places in Egypt where one is put so immediately and clearly in touch with the extraordinary length of Egypt’s history. It is just an hour’s flight in the evening to Egypt’s capital, Cairo where you will head to your accommodation, the Mercure Cairo Le Sphinx. You will visit one of the Seven Wonders of the World by horseback. In the morning, you will saddle up for a two-hour trail ride around the pyramids and the ancient sphinx. Once you reach the iconic pyramids, you will have time to explore these breath-taking structures and the chambers where the pharaohs were buried before visiting the mythical sphinx with its body of a lion and head of a human. A delicious lunch will be provided with views of the pyramids. No trip to Cairo would be complete without a visit to the Cairo museum, the home to a host of Egyptian artifacts and the world’s largest collection of pharaonic antiquities. It plays host to more than 120,000 pieces of ancient Egypt. Highlights include Tutankhamun’s famous rooms, the royal mummies, and jewelry rooms. You will enjoy your breakfast before back to your home. Arabian horses are famed for their beauty and endurance. Developed in a desert climate and prized by the nomadic Bedouin people, they were often being brought inside the family tent for shelter and protection from theft. Selective breeding for traits including an ability to form a cooperative relationship with humans created a horse breed that is good-natured, quick to learn, and willing to please. The Arabian also developed the high spirit and alertness needed in a horse used for raiding and war. This combination of willingness and sensitivity requires modern Arabian horse owners to handle their horses with competence and respect. During this trip, you will visit Banana Island, Mortuary Temple of Ramesses III, Valley of the Kings Tombs, pyramids and the ancient sphinx, and Cairo museum and take a private boat at sunset down the Nile. Luxor offers numerous riding opportunities and cultural trips on horseback, from galloping through the desert at dusk to splashing through the shallows of the River Nile. Days can be spent riding through traditional villages and under the shade of palm trees. You are almost certain to see water buffalo wallowing in the River Nile, and you will marvel at Royal Ibis fearlessly dunking themselves in alongside. Here you can watch sensational sunsets from the top of a sand dune before riding back past the ancient temples of the West Bank. There are no words to truly describe how beautiful Luxor is. It is something that has to be experienced personally and what better way to do it than on horseback. The bay’s crystal blue waters and golden sand make it one of the most picturesque places in the Red Sea. Makadi Bay has a laid back feel to it, having once been a quiet fishing village, and the views are quite astounding. On the western coast of the Red Sea nestled gently between serene desert sand dunes, it also boasts long stunning stretches of gently sloping white sand, translucent waters, and inshore reefs that are home to exquisite marine life. This tranquil destination is ideal for lovers of snorkeling, divers, and horse riders alike, and is ideal for one of the most popular excursions, swimming with horses. You will be served daily meals and water bottles included in the price. Soft and alcoholic drinks are payable locally. Please book your flight to arrive at Hurghada International Airport (HRG). Transfer from and to the airport is included. Ride Egypt will pick you up from the airport. Ride Egypt recommends departure flights from Cairo. If it is more convenient to arrive and depart from the same airport, you can use either Hurghada or Cairo, but you will then need a short internal flight from one to the other at the start or end of your holiday. Shared transfers are included in all of your riding holidays, and sometimes these transfers will gather together people arriving on separate flights before setting off to bring you to Ride Egypt. 1. Arrival between 8:00 a.m. and 7:00 p.m. and based on a minimum of two passengers sharing a car. 2. In situations where you may need to wait for up to two hours for other incoming flights to deliver guests for a shared transfer, you can have some relaxation time at the airport following your flight or take a private transfer at extra cost. 3. If there is more than a two-hour wait, a private transfer or a hotel room will be offered at an extra cost. Airport: Hurghada International Airport Airport transfer included: Hurghada International Airport No additional charges. You can request this in the next step. Ride Egypt is a multi-awarding winning British brand offering the best horse riding holidays in Egypt. There is a surcharge of 100GBP per person for Christmas and New Year dates. Ride Egypt offers 10% discount on all holidays booked with travel before 1st June 2019. Once the holiday is paid 60 days before arrival, the amount is non refundable. Ride Egypt takes a tip kitty on day one of the holiday of $100 per person. Egypt is a country that tips are a way of life. $100 covers hotels, porters, guides, horseman guides, grooms, drivers, camel guides and boat guides.